Tom Herron on the works Suzuki. Herron, who made his mark at world Grand Prix level and the major road races, died aged 30 after crashing on the final lap of the Superbike race at Juniper Hill as he battled for third place. 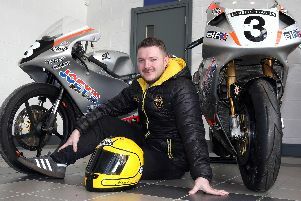 Former Tom Herron sponsor Jim Finlay pictured at his home in Lisburn. On a bleak day that became known as Black Saturday, Scottish rider Brian Hamilton also died in a crash while Armoy man Frank Kennedy was seriously hurt and later died from his injuries. On Friday, a special tribute edition of Road Racing Ireland magazine paying homage to Co Down racer Herron, compiled by Editor Leslie Moore, will be launched at the Blackhorse NI Motorcycle Festival at the Eikon Exhibition Centre in Lisburn. The 116-page magazine features tributes from former world champions plus accounts garnered over the years from Herron’s former Suzuki GB team-mate Barry Sheene and Joey Dunlop. 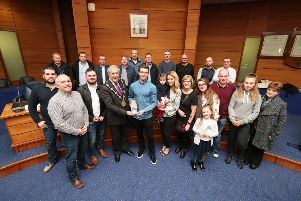 One of those paying tribute to the iconic motorcycle racer is Jim Finlay, a former sponsor of Herron’s who remains one of the sport’s longest-serving backers. Finlay, who is approaching his 50th year as the title sponsor of the Sunflower Trophy meeting, has always been synonymous with Herron and 40 years on from his untimely passing, both men are often mentioned in the same breath. In an extract from the magazine, Finlay recalls how he first became involved with the young Ulster rider. “Back in the 1970s I branched out, setting up my own business J.A.S. Finlay Ltd and put everything I had into getting it up and running, which took up most of my time. “One evening during the local news there was an interview from a young motorcycle racer, Tom Herron, who was making an appeal for people to come along to his benefit night to support his 1976 World Championship Grand Prix campaign. “I have no idea why but there was just something about him that appealed to me in that a young rider from Northern Ireland was heading across Europe to take on Giacomo Agostini and Barry Sheene. The next day I gathered up every penny I had to my name - even from the cash box - got into my car and drove to Kilwaughter Hotel near Larne where Tom was having his benefit night. Plenty of success followed as Herron, leading the 250cc Grand Prix World Championship, won the 500 Senior and 250 Lightweight races at the Isle of Man TT. With the Finlay banner emblazoned across all four of his privateer machines in 1978, Herron won the Senior TT, clinched a double at the North West 200 and a treble at the Ulster Grand Prix. He finished fifth and sixth in the 350cc and 250cc GP World Championship respectively and earned the chance to join Barry Sheene in the factory Suzuki team for the 1979 season. Incredibly, he finished third in the opening 500 GP round in Venezuela but his blossoming career was tragically cut short at the North West. Finlay vividly remembers the moment the news filtered through on that fateful day while he was in the Carrig-Na-Cule hotel in Portstewart. “Whilst I was searching for my jacket that Tom had given me that morning someone told me that he had crashed but at that stage I was more annoyed that someone had taken the jacket,” he said. “Then what seemed a few minutes later I was told that Tom had gone. The whole place went silent as we tried to comprehend what had just happened. I don’t think that I will ever be able to describe that moment as we felt so numb. “We pulled ourselves together and buried Tom later on the Monday, an end of an era and a great friendship.